I have raw garlic every morning after breakfast. I know, i know, most of you are saying GROSS! I don't chew the clove. I have a garlic crusher & i crush the clove into a spoon. I down the crushed garlic with 1 caplet of Viral Guard and a cup of green tea. This way I don't have to chew the clove, thus eliminating the smell of garlic breath :-) Last but not least... sufficient Rest is also required. Garlic is a great antioxidant- which fight off free radicals in the body. 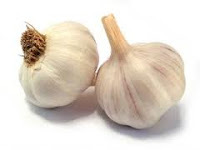 Recent studies also show that garlic is a powerful Natural Antibiotic. The body does not appear to build up a resistance to garlic so it's benefits keeps building over time. Take your Garlic every morning...Winter is here!! !